Ludwig Bamberger was born in 1893 in Lichtenfels, Germany, and Thea Spier in 1898 in Frankfurt. Their families were friends, and Ludwig and Thea married in 1922. Ludwig was a successful basket manufacturer, and the newlyweds had a fine home in Lichtenfels filled with German art and books. They had two daughters, Anna, born in 1923, and Eva, born in 1927. 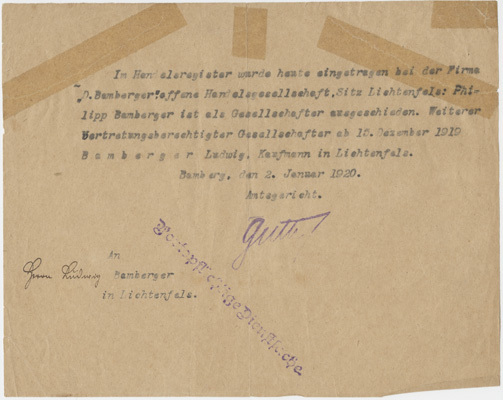 In September 1938, several weeks before Kristallnacht, Ludwig and Thea traveled to the United States to visit their families. While in New York, a telegram arrived notifying them of permission to immigrate to England. They sailed to London without ever returning to Germany. They had none of their personal belongings and only ten marks, the maximum amount they were allowed to take out of Germany. After Kristallnacht, their home was looted by the Nazis and used by the mayor of Lichtenfels as his personal residence. All of their belongings were boxed up and put in the basement of the town hall. While in England, Ludwig, Thea, and Eva were moved to an internment camp for enemy aliens on the Isle of Man. Anna, being 17 at the time and considered too old to remain with her mother, was sent to stay at the country house of a business partner of Ludwig. For nine months, none of them knew the fate of the others. Eventually they were all released and returned to London. Ludwig and Thea moved to Charleston, South Carolina, in 1949 to be near Anna, who had met and married Karl Karesh, an American serviceman, in London in 1943. Amazingly, they succeeded in recovering some of their belongings that had been stored in the basement of the Lichtenfels town hall. The cache was located by Gerald Bamberger, a nephew of Ludwig who was serving in a special intelligence unit of the United States Army assigned to Lichtenfels after the war. In 1954, after years of negotiations and advance payments, Ludwig was able to have some of the family’s furniture crated and shipped to his home in Charleston. 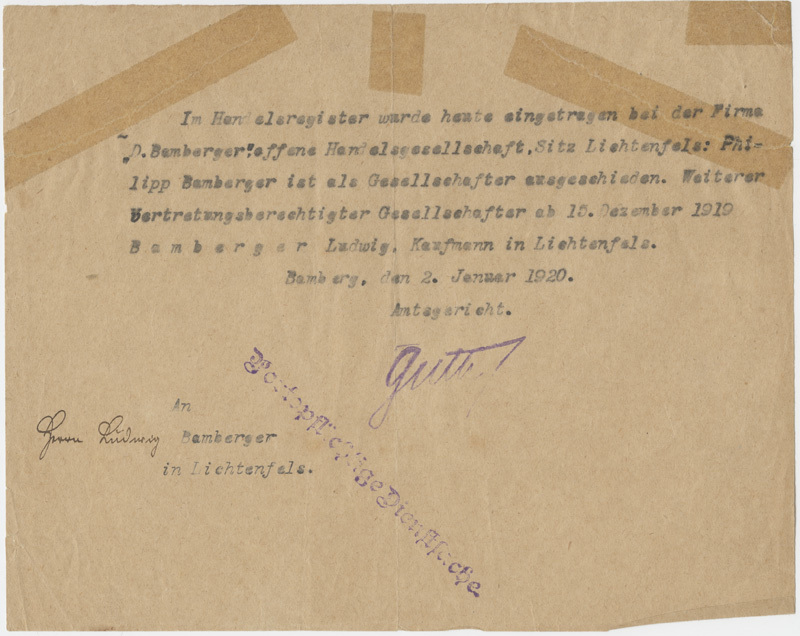 This is the 1920 business registration for the Bamberger family business, D. Bamberger Lichtenfels.